The Center for 21st Century Music's fall concert season continues with the a program of works by four 20th-century composers: two household names, Igor Stravinsky and Darius Milhaud, and two somewhat lesser known composers, Donald Martino and Silvestre Revueltas.The music will be performed by the Slee Sinfonietta, conducted by Robert Treviño and featuring in the Martino Triple Concerto Garrick Zoeter on clarinet, Jean Kopperud on bass clarinet, and Ken Thomson on contrabass clarinet. The concert will take place at 7:30 p.m. on Tuesday, Oct. 29 in the Lippes Concert Hall in Slee Hall on the University at Buffalo's North Campus in Amherst. Tickets are available at the Slee Hall box office, (716) 645-2921. Donald Martino composed the Triple Concerto (1977) as a 60th birthday gift for Milton Babbitt. It is scored for a chamber orchestra of 16 players and a trio of clarinets: soprano (Bb), bass, and contrabass. Martino regarded the clarinets not as three separate solo instruments, but as one "Superclarinet, a six octave gargantuan who would use the concerto as a world in which to romp and play with Superfriends." To do this, he discovered ways to bridge the gaps in timbre and articulation between "the elegant Soprano, the poetic Bass, and the obstreperous Contrabass." As with all his large-form works, Martino had the sense when listening to the Concerto that he had composed a story in sound that evolved in a similar way to the spiritual journey of a human life. Translated literally the Spanish title Ocho por radio (1933) means "Eight by Radius." But Silvestre Revueltas, lover of wordplay, invested his title with a sly double entendre: a mathematical reference to a circle with a radius of eight units and a description of an ensemble of eight musicians arranged in a (semi)circle performing live on the radio. Revueltas, mostly indifferent to the European classics, was very fond of taking the folk and popular music of his homeland Mexico and investing it with a forceful rhythmic character, earning him the nickname: the Mexican Stravinsky. Ocho por radio is written in A-B-A form. The two outer A sections are fast and syncopated, while the middle B section is more relaxed and wistful. The piece ends with a short upbeat coda. Like so many artists of his generation, Stravinsky was deeply affected by the horrors of World War I. In reaction he shed his Rite of Spring enfant terrible reputation and headed off in a radically different neoclassical direction. One of the first pieces he wrote in this style was the Octet (1923). Determined to avoid the lush strings and lavish gestures of Romantic music, he chose an edgy timbral palette of eight wind instruments: flute, clarinet, two bassoons, trumpets in A and C, tenor and bass trombones. The piece is in three movements: the first in sonata form, the second a theme and variations, and the third a rondo. 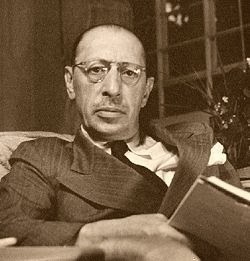 Stravinsky (secretly) dedicated the Octet to Vera de Bosset, with whom he had fallen in love a few years before, and who would eventually become his second wife. In 1922 Milhaud went to Harlem, where he found the music to be "absolutely different from anything I had ever heard before and was a revelation to me. Against the beat of the drums the melodic lines crisscrossed in a breathless pattern of broken and twisted rhythms." He made plans to incorporate jazz into a chamber work, and got his opportunity less than a year later, when Rolf de Maré commissioned Milhaud to compose a ballet based on African legends. At the first performance of La création du monde (1923), critics denounced the piece as frivolous, more appropriate for a dance hall than a concert hall. 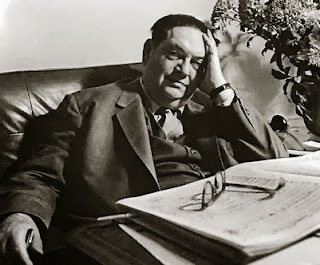 Ten years later, the same critics – now ardent students of the philosophy of jazz – declared La création to be Milhaud's finest work.